This is the tragic start of what seems to be a never-ending journey into a world of loathsome creatures and wicked souls. Explore seven danger-ridden worlds as you fend off mutated beasts with swords, knives and bows. Transform into an aerojet and fly over mountain peaks and lifeless deserts. Turn into an aquaskimmer and cross the blue seas. Or become a submersible and dive to a sunken palace. Live through three generations in this epic adventure and fnd out what lies behind the realm of terror. Only you determine which of the four endings you'll experience. --From the Genesis Phantasy Star 3 instruction manual. 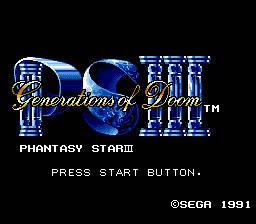 Play Phantasy Star 3 Now! (Orakians) from killing the followers of Laya (Layans), and vice versa. Nobody can remember how the war between the two ended, and both sides believed they won. However, what the people didn't know is that the end of the war ended in a truce and a final battle against an evil. Now, 1000 years after the war, a mysterious girl is washed along the shores of Orakio's hometown of Landen. This girl is found by a direct descendant of Orakio and the Prince of Landen named Rhys. Little does Rhys know that this girl's finding would change the world forever.